Now available at the Thompson Center for Plastic Surgery, Colts Neck, NJ. 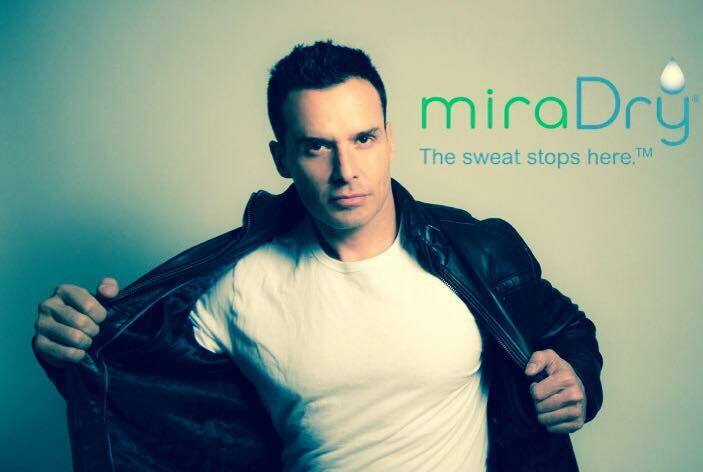 miraDry® – a lasting, permanent solution for bothersome underarm sweat and/or odor. Enjoy freedom from embarrassing underarm sweat and odor! Are you bothered by your underarm sweat and/or odor? Are you worried about underarm sweat outbreaks? Now, there is a lasting solution that can make embarrassing sweat and odor a thing of the past. Take control of your life with miraDry® – a non-invasive solution that provides lasting results. The miraDry® procedure is quick and non-invasive. The miraDry® System delivers precisely controlled energy to the region where the underarm sweat glands reside, and eliminates the sweat glands non-invasively. Because the sweat glands do not come back or regenerate after treatment, the results are lasting. And, results are fast – you can expect to see sweat reduction immediately after treatment, with minimal to no downtime. Dramatic sweat reduction without the use of harsh chemicals, toxins or surgery! The miraDry® procedure uses the only non-invasive technology that is FDA cleared and clinically proven to dramatically reduce sweat and odor providing lasting results. Now there is a lasting solution to sweat and odor control that doesn’t use harsh chemicals, toxins or surgery. The miraDry® procedure is quick, non-invasive and provides a lasting solution for bothersome underarm sweat and odor. The handpiece from the miraDry® y System, when placed on the underarm, delivers precisely controlled energy to the region where the sweat glands reside and eliminates sweat glands non-invasively. The sweat glands don’t grow back once eliminated, resulting in a dramatic and lasting reduction of underarm sweat and odor. Most patients report a dramatic reduction of their sweat and odor– in a recent clinical study1, the average sweat reduction was 82%. You should see a reduction in sweat immediately after treatment. As with any medical procedure, results will vary by person. How long will the results last from miraDry®? The results are lasting because the sweat glands do not come back or regenerate after they have been eliminated. The miraDry® procedure uses a safe, non-invasive technology that is FDA cleared to eliminate sweat glands in the underarm. If embarrassing underarm sweat outbreaks, stained clothing, odor or frequent antiperspirant application interfere with your daily life, then you may be a good candidate for the miraDry® procedure.